The Karlsplatz-Passage is currently detached from its aboveground surrounding. The proposal wants to reconnect it with the urban context and reinforce the passage as a vivid street space and link between Vienna’s main cultural institutions situated at the Karlsplatz. By providing options for art displays and installations, the traffic building is transformed into a kind of art gallery where cultural institutions can present themselves. 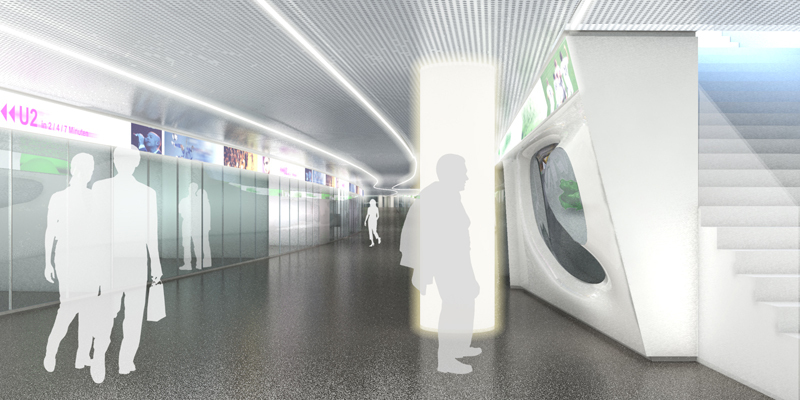 Informations, cultural programmes, video art and advertisments can be shown on the continuous information screens that accompany passerbys through the passage. 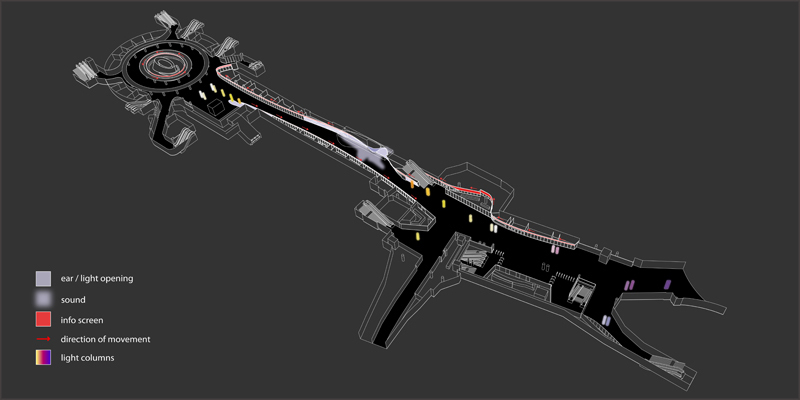 The design intends to “shorten“ the passage by inserting a new attraction - the ear in the narrowest section, the so-called “shopping street”. Here sound art can be installed or live-concerts broadcast. 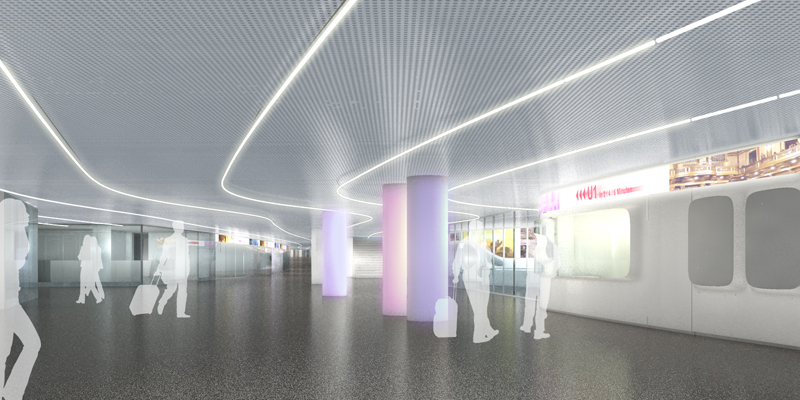 The opening lets sunlight enter the passage and links it visually to aboveground. 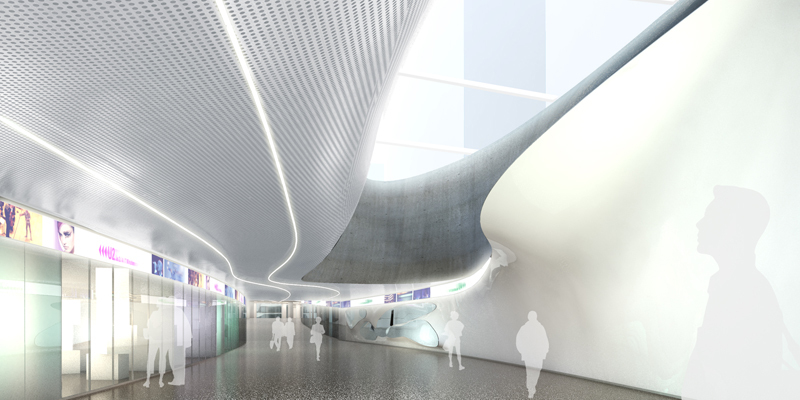 The ear develops out of the interlacing of three elements - wall, handrail and ceiling. Its warped geometry combined with functions on both sides of the street break the linearity and perspectivity of the space and generate a changing spatial experience while walking through.